Stacy of “not just a housewife” always loved design and started tearing out pages of magazines and sticking them in her journal at about age 10. Well Stacy has come a long way. She takes pride in having unique pieces in her home designed and built by her. She is married and a stay at home mom of four little boys. With four boys she needs some “Felt Face Activity” to keep them busy. Stacy has a cute tutorial for us and I think boys will love making all types of funny and strange faces. Thanks Stacy for the fun idea. 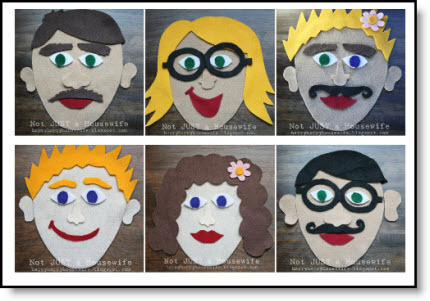 These FELT FACES can add to your stash of travel activities!